We have an approved NOW for a 3 year drilling program. This program will focus on the discovery of a resource and mapping the resource in relation to surface and bedrock. 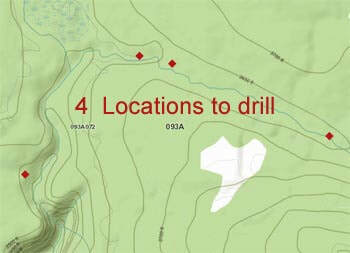 ​Drilling locations are spanned 50-100 meters apart and are laid out to allow for mapping of a resource. There is a total of 96 locations. ​We are using a 10inch auger drill and the environmental footprint will be small. ​We will be utilizing existing accesses which will also keep the costs very low. ​It is our goal to do a handful of strategic drill holes to get started and determine the potential for more exploration. ​We are looking at several possibilities of financing this project. Ideally we are seeking more partners to finance our exploration. ​However there is the option of a private offering of shares with the potential of going public or making a return from an agreement with another company.